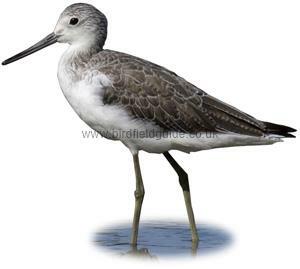 In winter the Greenshank has pale grey upperparts, it's underside, including the throat and breast is white. The back of the neck is finely streaked with light grey. It's legs are greenish yellow and it has a long bill which is very slightly curved upwards. 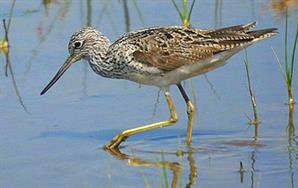 The Greenshank is a large but elegant wader. Often seen in small flocks of seven to ten birds on winter estuaries. The birds call is loud and distinctive. Note the light barring on the tail, white rump and bright white underside. This bird is not in full summer plumage, but still has the darker grey-brown upperparts, and some streaking on the breast. Breeds in Northern Europe including Scotland. 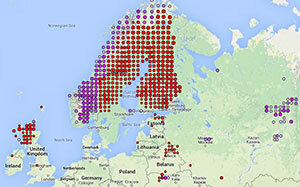 Birds in the very North migrate South in winter. UK birds usually stay resident but can be boosted in winter by passage migrants. Likes to nest in upland forest clearings and moorland. In winter it can be seen across a variety of wetland habitats including inland pools and marsh, but mostly it is seen in muddy estuaries. 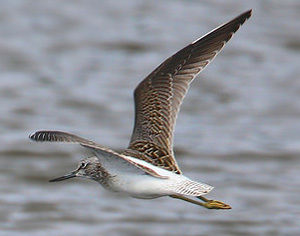 Greenshank in winter plumage, note the pattern of the back feathers. 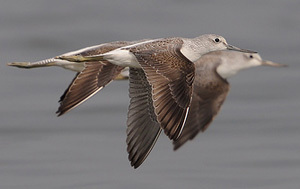 In flight the Greenshank has plain dark upperwings, and plain light underwings. The rump is bright white, and the tail lightly barred. The slightly upturned bill is usually more obvious when flying. 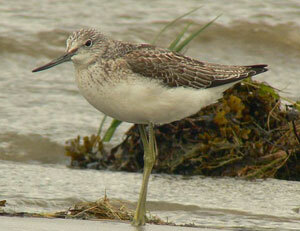 Note the green legs and the birds slightly upturned bill, a good indicator that this bird is a Greenshank. Also note the fine grey streaking on the birds head and neck. 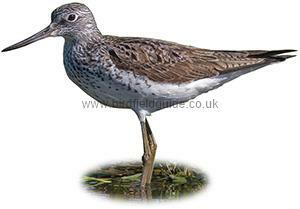 The Greenshank in summer has grey-brown wings, it's head, neck and breast has heavy dark streaking. The legs are green and the underside bright white. Some larger back feathers are black centered. Note the back feathers which are a mixture of black, grey and brown. Larger feathers are edged white. The breast and neck of this bird have heavy streaking, typical of a bird in full summer plumage.